I have three bone color jars like this one two small one larger one. Does anyone know what these were used for.? Hi Carol! Thanks so much for your comment. Now you have me even more intrigued than ever! That is so cool that you not only have the same style of jar, but that you have them in a different color and two different sizes! If I ever find out what they are for, I will post it here. If anyone out there can solve this mystery for us, please let us know! I have a jar today 9-24-16 at a flea market identical to the original torques one in post…. mine is yellow… I also have no idea what it is.. 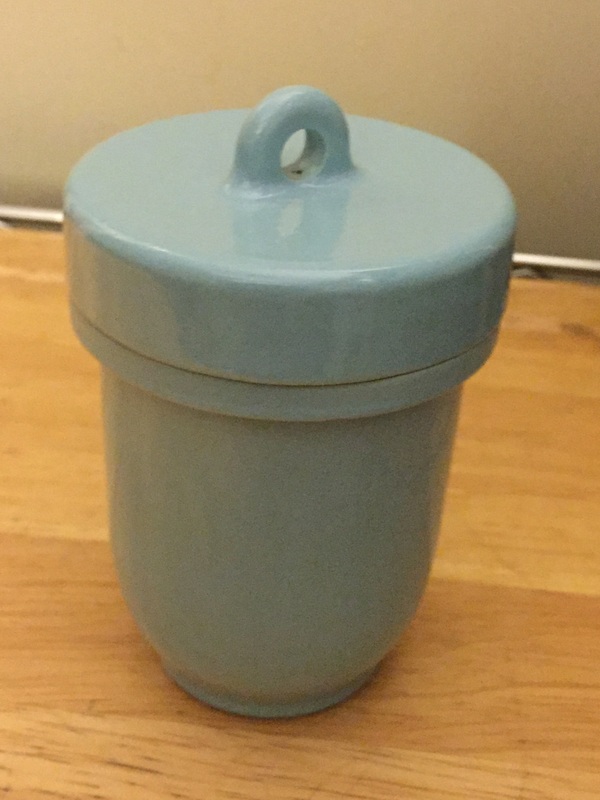 I was thinking maybe a vintage restraint mustard jar and maybe the top of the lid the circle opening is for the condiment spoon? Just a thought I am trying to do research to find out what this is! I will share if I find info! This is so exciting! Please do let us know. I still have no idea what they are! I have found out what these neat little jars are! They are T. TAYLOR EGG BOILERS USA PATENT NO. 49405… they have 3 1/2″ single egg CODDLERS and 4 1/2″ double egg CODDLERS. IF U SEARC EGG CODDLERS MADE IN ENGLAND THERE IS A WOLE WEBSITE WITH ENDLESS INFO! Let me know if you where still searching for info on the jar! They are made from 1914 – 1927 if the lid does not have an imprint of REGD. 720797. Wow! Fabulous sleuthing! I can’t wait to do a search online for the info you just posted. Thank you so much for taking the time to share your findings! Never in a million years would I have guessed they were egg coddlers! Mystery solved thanks to you! Glad to help! I love old dishes! Especially restaurant ware! I enjoy finding them and then researching when I don’t know what they are! Vintage items are so neat! Restaurant ware seems a really interesting category to collect! I agree with you about vintage items. They always tell a story, and I LOVE a good story! Happy collecting! ← Dental Trays! Who Knew?